So what are they going to complain about NEXT? Yeah, gay couples and heterosexual couples are totally "equal" now. The Supreme Court said so. So let's see 'em make a baby together. Be careful of what you wish for - you may actually get it. 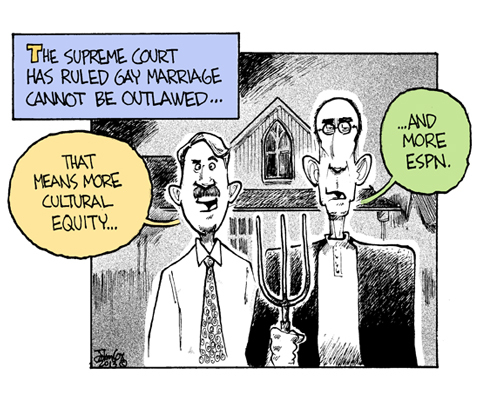 The SCOTUS only overturned DOMA. Deferred on CA's Prop 8, which was promptly squashed in a lower court. According to both the SCOTUS & the POTUS, it's a "States' issue"--still illegal in 36 [or 37]. This page contains a single entry from the blog posted on June 28, 2013 1:05 AM. The previous post in this blog was Community Theater Logo Illustration Idea.